The mice have eaten the bait but the traps did not go off, we have reset them with mars bar (only the best for our four legged friends). Good news, our electrician has fitted a new isolator to the workshop in deviation shed. 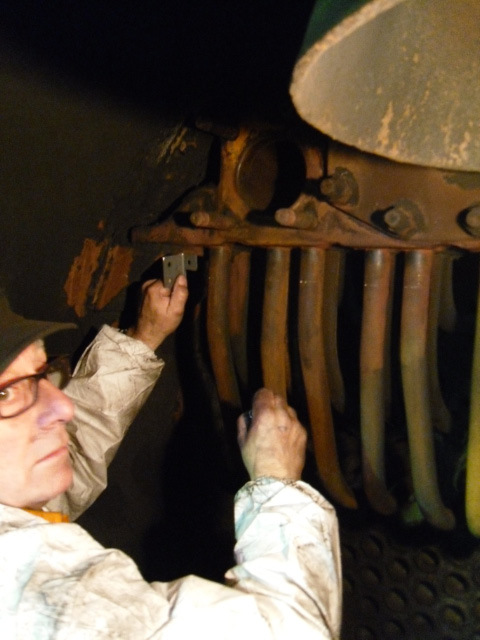 Quite a bit of progress today with five workers on the loco; valve covers were removed & the lubrication pipes under the steam chest. 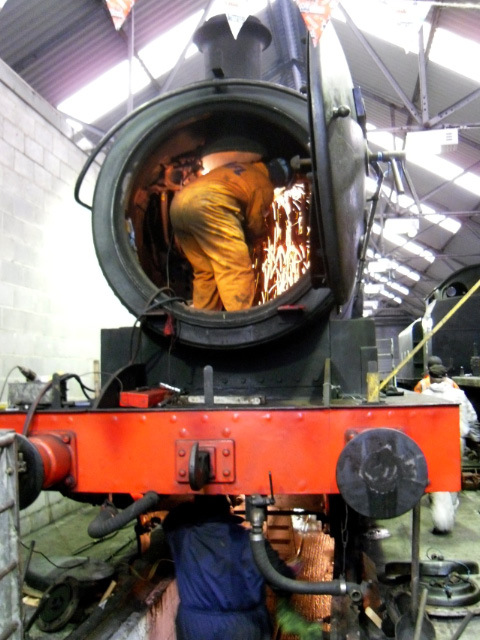 The steam pipe for the reverser has been annealed & cleaned ready to be refitted onto the loco. The brake ejector in the cab is still fighting back, the exhaust pipe is off but the steam pipe still refuses to give up its hold. Do we have a large ‘c’ spanner to take the nut off the vacuum pipe at the bottom? The dome cover is safely down on the floor & put into storage. 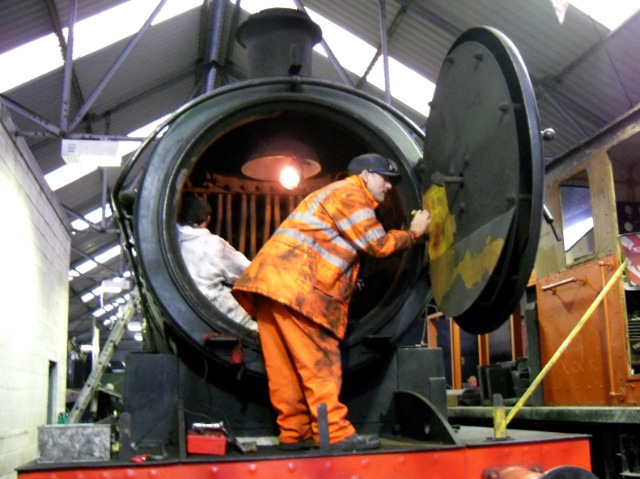 The left steam pipe was taken out of the smoke box & the ends of the front row of elements were cleaned, where they go into the header. A gauge was made to mark a datum from the header, so the elements can have a new piece of pipe welded back on & expanded into the header. Our tame burner had these cut in no time at all. A plan was devised between us to get the elements out. 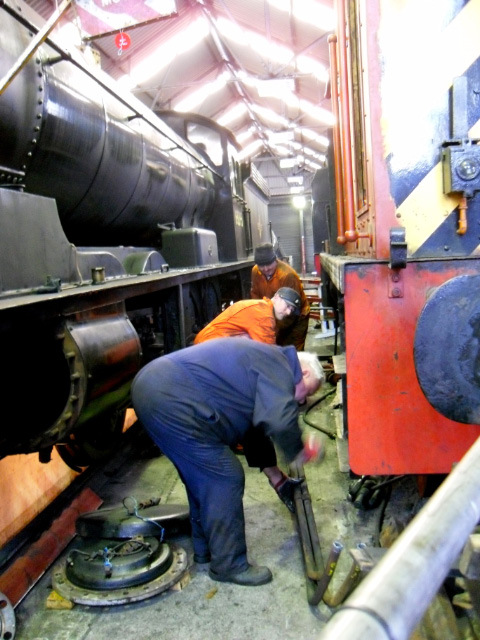 We used a chain lift to pull the elements free in the smoke box, then manipulated them onto a stand in front of the loco & then onto the floor. A total of five elements were removed today, but the blast pipe will have to be removed before the centre two will come out. As there is no storage space left in deviation shed, we have put the elements in the walkway behind the gates in the 6’, road 6 to 7. Please be aware of the tripping hazards if you require access to this area. Company car is available from Teesside for Wednesday workers. Broken stud from dome in vice outside workshop to put with nuts & washes stored with mud doors.